There is always a debate regarding coconut flour vs almond flour. Both are gluten-free, both are grain free and both are used heavily in low carb and Paleo cooking. Both are less processed than “healthy whole-grains”, both coconut flour and almond flour are more nutritious flours without the need for fortification, that many wheat-based products often have. So why am I changing? UPDATE :: I have just added a brand new category for coconut flour recipes OR recipes where I give a coconut flour conversion. You can see them HERE. 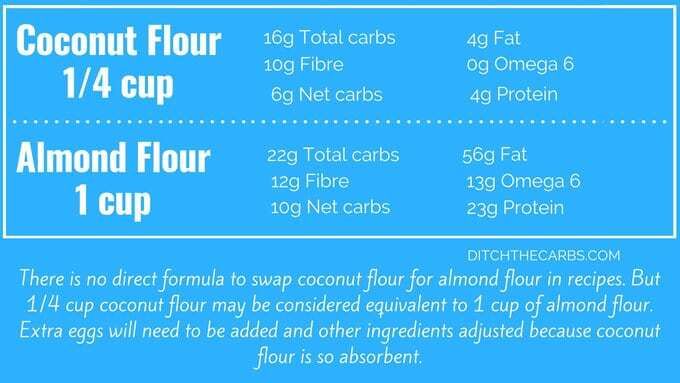 Before we begin the coconut flour vs almond flour debate, you may wish to learn more about low-carb flours. Read my Ultimate Guide To Low-Carb Flours. 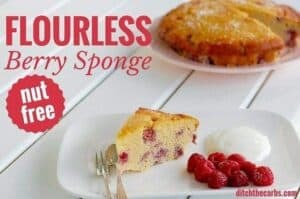 It is a general overview of low-carb flours and how to use them. And if you don’t like, or can’t tolerate coconut flour, don’t worry. I will continue to experiment with almond flour/meal, but I have made the conscious decision to make the majority with coconut flour vs almond flour. I will try to add substitutions for older recipes. For example, I have added instructions to my Fat Head pizza recipe. 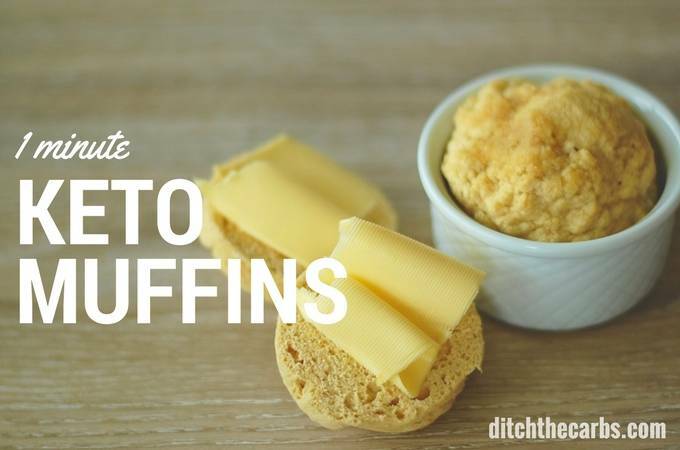 You can now make it with almond flour OR coconut flour. 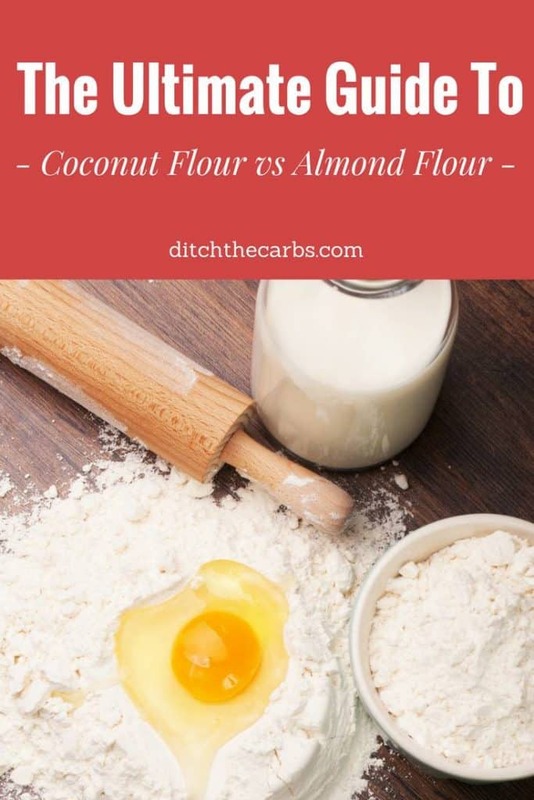 Coconut Flour vs Almond Flour – Why am I making the change? This year I have decided I will be baking more with coconut flour vs almond flour. Why am I switching to coconut flour vs almond flour? – cost, health and allergies. Cost – coconut flour is cheaper to use. Prices vary from country to country, and what is currently on sale, but for us in New Zealand, coconut flour is half the price of almond meal/flour. Not only is coconut flour cheaper to buy, but the amount you use in a recipe is also incredibly small compared to almond meal/flour. A cake might require cups of almond meal/flour, whereas a coconut flour recipe might only require 1/4 of this. It takes 90 whole almonds to make 1 cup almond flour. It is too easy to overindulge in almonds from almond flour low-carb baking. With the increasing number of allergies, more readers are asking for tree nut free recipes. And as many parents know, an increasing number of primary schools and kindergartens are making a nut-free policy for baking and school lunches. So many low-carb recipes use almond flour/meal, it limits what baking we can send our children to school with. Depending on where you live this may vary, but here in New Zealand, coconut flour is almost half the price of almond flour/meal. Coconut flour is a pretty economical low-carb flour to buy and to use because you only use 1/4 of the volume of almond flour. Almond flour has a higher fat content but it is the quality of fat that is important to consider. Almond flour is high in omega 6 which is the inflammatory polyunsaturated fat we want to avoid in large quantities. Coconut flour is lower in fat (another reason why it is so absorbent for liquids in recipes), but it is stable saturated fat. Omega 6 is inflammatory and omega 3 is anti-inflammatory. In the past, our omega 6:3 ratio was closer to 1:1, in modern times it has moved to be 15:1, i.e. : a highly inflammatory diet. “Excessive amounts of omega-6 … promote the pathogenesis of many diseases, including cardiovascular disease, cancer, and inflammatory and autoimmune diseases, whereas increased levels of omega-3 PUFA (a low omega-6/omega-3 ratio) exert suppressive effects.” Source. Click here to see why it is inflammation that is the biggest risk for heart disease rather than the cholesterol myth. Click here to read my Ultimate guide to healthy fats. High in fibre – both coconut and almond flours are high in fibre. High in protein – coconut flour isn’t as high as almond flour, but when you consider baking using coconut flour generally requires more eggs to help the baking rise and improve moisture, it can be considered a higher protein option. 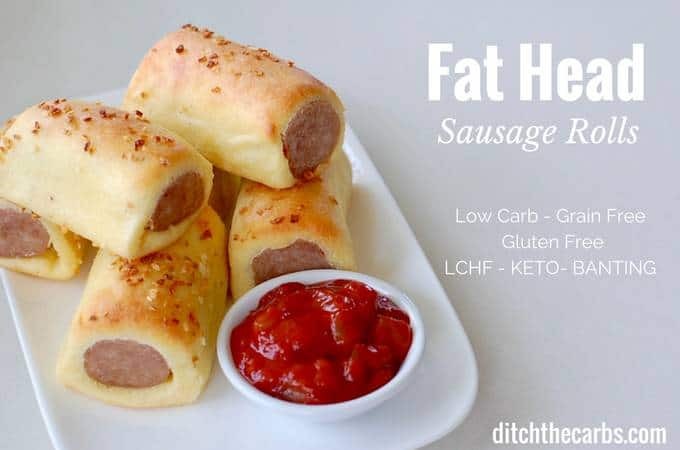 Low carb – both are lower in carbs than wheat and grain-based flours. 1 cup of wheat flour contains a whopping 73g net carbs compared to 10g net carbs in 1 cup of almond flour, and 6g net carbs in the equivalent 1/4 cup of coconut flour (40% less than almond flour). Nutrition – there’s not much in it, but both are better than wheat and grains. Don’t rely on low-carb baking to provide you with the basis of your nutrient dense diet. Low-carb baking, whether it is from coconut flour vs almond flour, should not be relied upon regularly. Part of the ethos of going low carb is not to rely on the sweet tastes, not to rely on treats but to use them occasionally. 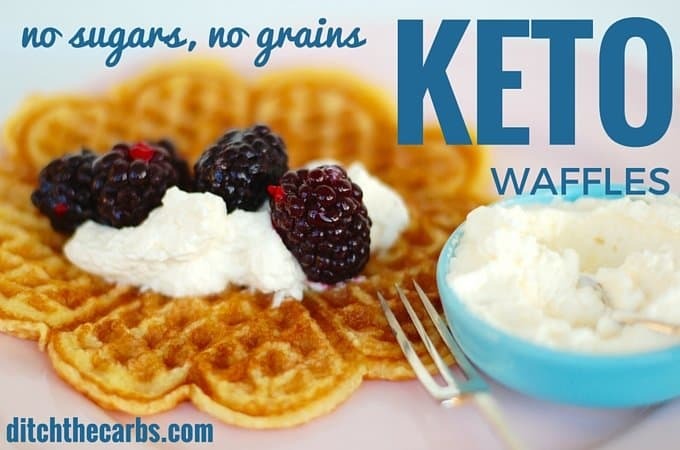 It is always better to reach for a low-carb treat rather than a highly processed, high-carb one, but they must begin to make less of an appearance in your weekly meal plan. Unless you are very experienced at low-carb cooking, you cannot directly substitute coconut flour for almond flour in recipes. Coconut flour may need flavouring in sweet or savoury recipes to over-ride the subtle coconut flavour it has. Some people are more sensitive to the subtle flavour of coconut flour than others. For those of you new to cooking with coconut flour, it can be tricky to work with unless you understand how coconut flour works and behaves. 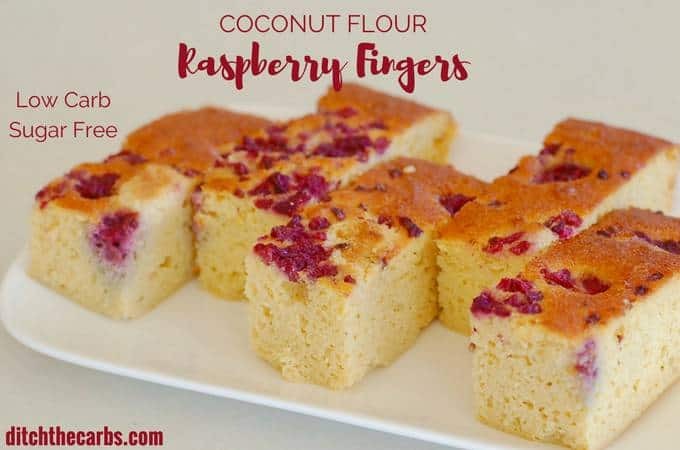 Once you feel comfortable with the properties of coconut flour, you might want to try experiment converting some almond flour recipes. The best recipes to begin converting, are those that aren’t heavily based on almond flour. Coconut flour is the dried flesh from the coconut. It is incredibly absorbent and it is best left to swell and absorb the moisture it has been mixed with. 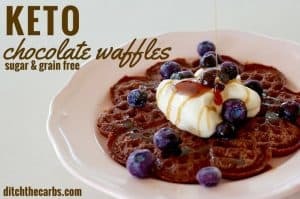 For example, if you were to make my keto waffles and don’t allow the batter to stand for a few minutes while the waffle maker is heating up, you may think the batter is too liquid and too runny to create the perfect waffle. If however, you allow the batter to rest for a minute or two, you will see the batter thickening all by itself. Because coconut flour is so absorbent, you will need extra liquids. Extra eggs are required to help improve the texture of the baking and to help the cake to rise. Almond flour is a great replacement for breadcrumbs in recipes such as chicken nuggets, crumbed pork and grain-free fried chicken. Coconut flour will work in many of these recipes, but you need to use only a small quantity and it may not give you that crunchy texture you are used to with breadcrumbs. I’ve been on a low-carb diet for about a month-and-a-half now and this is Great information because it’s been a real challenge for me! I was wondering if you would know of a good recipe for pan fried sea scallops with almond flour or coconut flour. I’m not sure which would be best and wanted your opinion. I’ve been wondering, is walnut flour keto friendly? Great question. Here is the breakdown. You can see walnut flour is much higher in carbs, higher in protein and lower in fat. 1 cup almond flour = 21.9g total carbs, 12.1g fibre (so 9.8g net carbs), 23.4g protein, 56.4g fat. 1 cup walnut flour = 39.2g total carbs, 22.4g fibre (so 16.8g net carbs), 52.6g protein, 6.9g fat. Thank you for doing more coconut flour recipes! I am one of those with nut allergies so I really appreciate the change! My pleasure 🙂 I hope I can cater to everyone here by doing both as time goes on. this is great! One of your reasons for switching more to coconut flower is the same for me in Ecuador. a 2# bag of coconut flour costs me $2.50. a 1/2# bag of almonds (cheaper than the flour) costs me $7 !!!!!! I found a recipe for crackers that finally works for me – i.e. in the mixing and cooking – but it uses 2.5 cups of almond flour. they are great and crispy but possibly the most expensive crackers i have ever eaten.! I might make them again for a party but not for purely personal use – I LUV crackers. Whereas 64 grams of coconut flour contains 41g of carbs and 25 grams of fibre. Even if you only use 1/4 cup of coconut it is still much higher in carbs although much lower in calories. I’m afraid the numbers are correct. I get my nutritional diet from cronometer.com which uses the US national databases as reference. * I state total carbs, not net carbs as you have done. * I see you use calorie king from AUS. In NZ and AUS most of our goods are labelled with NET carbs, but then it gets trickier, some foods are imported with TOTAL carbs. * 1 cup of almond flour actually = 112g, 1 cup coconut flour = 112g ( both can vary slightly depending on US/AUS cups and moisture and hence density). Thank you so much for all this info. I’m finding that I’m having a problem with Almond flour. 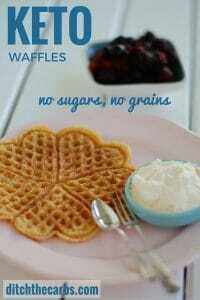 I made waffles with almond flour, then was unable to eat the rest of the day. I felt so full and bloated. This is all great information. I’m following you now!! Thank you for the article. It made everything clearer for me. But I still have a question. Some (specially bread) recipes require both type of flour… So is it essential or I can use only one type of flour? Like, coconut one. If a recipe calls for both flours, generally it is using the qualities of one flour to enhance the other. For example, there may be an almond flour bread or cake, but if there is also some coconut flour in the recipe, it will be there to give it a better crumb texture or to hold the eggs together. Thanks for the great article Libby. I’m a fan of coconut flour and have had great success with many recipes i have found on your site and other sites on the internet. I found the comparisons between the two flours very interesting and informative. Cheers. Thanks for the info. Part of your preference for coconut flour is based on avoiding tree nuts, but in fact almonds are drupes, just like coconuts; neither is technically a tree nut. Part of the reasoning for developing more (not exclusively) coconut flour recipes is because of the increase in nut allergies (I never specify “tree nuts”, as there are so many varied anaphylactic allergies suffered by so many people). And yes, I do emphasise the point that coconut is a drupe. But most people (schools included) make these generic nut-free statements or policies. Even the FDA refers to almonds as tree nuts. And here also. ?what about those of us who have an intolerance to coconut flour? So to substitute almond flour for coconut flour, I would try and use 1 cup almond flour for 1/4 cup coconut flour and reduce the liquid? Is there any other grain free flour that can be used in place of coconut flour? Yes, that is why I do not use one flour exclusively. I continue to develop recipes using BOTH flours because I have readers who are intolerant to one or the other. I love my almond flour keto bread (the best ever IMHO 😉 ) and my coconut flour cookies for example. I never Gove a straight conversion factor for coconut flour to almond flour (and visa versa) because there are so many factors that go into a recipe. so, 1/4 volume for coconut flour is THE SAME as one unit of almond flour ? or should i also add more eggs and other ingridiends ? No sorry. As discussed, there is no real easy conversion as do many other factors and ingredients whiten a recipe need to be taken into account. So I suggest to begin baking using these flours with recipes already developed suing them. Then once you are accustomed to the new flours, then you know whether to add extra eggs (some recipes are egg heavy already so this may not be appropriate) or extra liquid such as heavy cream or coconut cream etc. Or if the recipe is too wet, you need to add more flour, a tablespoon or partial cup at a time. This recipe stinks and just taste like a bunch of eggs! Nothing but a quiche texture! I am having difficulties using coconut flour to make any cookies or muffins and have thrown away quite a lot due to various failed attempts. I am thinking of trying Almond flour but am unsure as to how the texture is? As I don’t want to have similar texture to coconut flour which I can not use. Please advise. Am on gluten free etc diet. In nz, what are your preferred brands to buy? What about having the best of both worlds and combining the two flours? pls, am interesting in baking coconut flour bread in commercial quantity but i will need a good preservatives to make my coconut flour bread last long for 5 days. Pls i need advice on best preservatives to use . I’m afraid I can’t advise you on preservatives ( I don’t use any) and because coconut flour recipes call for a high amount of eggs, I only keep baked recipes fresh for up to 3 days. In the fridge if it is summer, in my pantry if it is cooler. So I make a keto flatbread(paratha) using the Headbanger’s Kitchen recipe of coconut flour and psyllium husk powder with a bit of baking powder,the bread comes out really well and is a good enough meal for me with 4 net carbs per piece.My question is it bad to eat this everyday if it fits in my macros. My sister says my weight loss will be very slow if I do this. 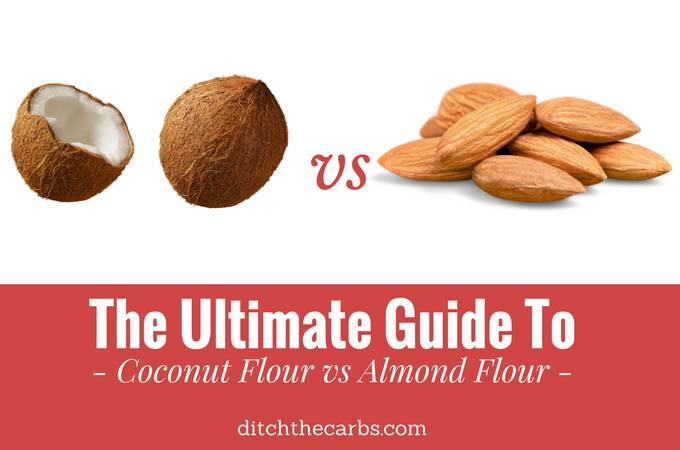 the bottom line is that coconut flour is so much higher in carbs than almond flour & when you bake a loaf of bread or make a cake w/ almond flour, how much are you going to eat a one sitting?! Not a lot! how many eggs per 1/4 cup of Coconut flour… I see we need to add more eggs, I just do not understand how many more. is every recipes calls for different amounts of eggs is there a standard of how many eggs per 1/4 cup of coconut flour..
thankz for the great information so far.. There is no straight substitution I’m afraid because there will also be other ingredients in each recipe which will affect the liquid/dry ratio. Each recipe will vary so start cooking with recipes that have already been developed using coconut flour. From my experience, it takes quite a lot of trial and error to get them right. If in doubt, add another egg but you may find the recipe too eggy. Add too few, and the end result may be dry and not holding together very well. Take a look at this page, it is all my coconut flour recipes. I have never liked the texture of foods baked with all or mostly coconut flour. I hope you can find solutions to this. That would be great! Hello, I am one of those few people who have a negative reaction to coconut flour. What other alternative to almond flour have you used with success in recipes? I have occasionally used sunflower and pumpkin seeds ground in my food processor, and I understand you can now buy seed flours. These may be a good option if you can tolerate them. Alternatively, continue to use almond flour/meal (if tolerated) but limit the amount and frequency. I still use both. Joseph Mercola’s new book “Fat For Fuel” has extremely good information on the importance of keeping a tight control on protein (as well as carbs) because of the damage they can cause to mitochondria – in fact he steers clear of almonds for that reason. Highly recommend this outstanding book. Hi Libby, what is the difference between Almond Flour & Almond please? Welcome 🙂 This other post is my Ultimate guide To Low Carb Flours. Almond meal is slightly coarser than almond flour. Almond flour generally has the skins removed and is a finer grade. I use almond meal for most recipes as it is cheaper to buy than almond flour. Any ideas for using coconut flour when someon has an egg allergy? Sorry no. I’ll see if I can find a solution. Coconut flour recipes do rely heavily on eggs to make them light an give it structure. I tried coconut flour in many recipes , never a success . Even as simple as pancakes , didn’t work . Coconut flour does take some getting used to, but as long as you read my tips, you should see an improvement. Flavour coconut flour well (no one likes dull pancakes), ensure you use enough eggs and allow the batter to stand for a while so the coconut flour can swell and absorb the liquids. I add loooottttsss of vanilla to mine. Tastes amazing. Any chance you could devise a coconut flour challah recipe? It has so many eggs already it seems like a perfect match. My gf is addicted to the stuff and having a healthy low carb option would be fantastic! Love your site! Thanks for all the info! I’ve had better luck with almond flour recipes, but I much prefer the taste of coconut flour to almond flour, and it fills me much more quickly (and for longer) than almond flour. Can coconut flour be used for thickening gravies and sauces? If so how much per cup of liquid? Thanks or all you do Libby. This is my fave locarb site! Try lightly toadying the flour before adding it to your gravy liquids, medium heat in a pan. Then use an immersion blender to get any clumps out. Unfortunately coconut flour does not agree with any members of my family. I always want to make your recipes but the coconut flour nixes the idea. Thank you so much for this info. I am buying more coconut flour today. So interested to see how your fathead recipe turns out with coconut flour vs, almond. Hey Libby, I’m soooooo glad to read this article. I just LOOOVE coconut flour and its taste, and am always trying to find recipes for it! Thank you and cheers from Germany! Great article and so glad you are taking this direction. My nieces are students and have got the “low carb” message but a lot is beyond their flat’s food budget. It would be good to serve them up examples of healthiness thats easy on the wallets. I have been trying to move away from using so much almond flour here lately. So I was thrilled to see this article. Now if I could just figure out the right conversion for using coconut flour in recipes calling for almond flour. Quite a lot of Banting recipes use Sunflower meal instead of almond flour. Nice nutty flavour in savoury dishes. Make it fresh in a blender as it doesn’t store well. Do you have a suggestion for a coconut flour that doesn’t taste very coconutty? My daughter really does not like the coconut flavor in her food. She even notices it in refined coconut oil. The brands I get here in NZ may be different to the rest of the world. My biggest tip, is to flavour recipes really well. For sweet baking I always make sure I use plenty (sometimes excessive) vanilla. For savoury recipes, make sure you use enough salt and pepper. I also find coconut flour has quite a sweet flavour and consequently we don’t like it so much in savoury recipes, but I will try your idea of increasing flavourings and adding more salt and pepper. Certainly I find your use of vanilla in recipes really good when you are removing the use of sugar / sweeteners from your life! I have taken to buying vanilla paste as I read you suggested, [somewhere], and it is much, much better than vanilla essence. It took me a while to find it as our local rural town supermarket did not have any… needed a bit more upmarket town!! I like the fact that coconut flour has less carbohydrates for the quantity you need, and costs much less. It is available in our rural supermarket so must be becoming more mainstream! I look forward to more coconut flour recipes! Even when I have used almond flour, I always try to use less and add coconut flour. I find using both works well but would rather just use coconut flour. Thank you for this excellent article. It will definitely help transition my family to more low carb recipes and keep it budget friendly. 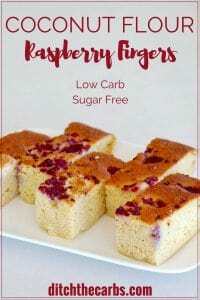 This is one of the reasons I am slowly swapping over, as I am in many low-carb family and budget groups where they cannot make low-carb baking because of the cost of almond flour. I want to make LCHF as affordable as I can for families. My absolute passion is to get entire families eating this way. What about baked goods with Coconut flour tend to really dry your mouth out? I used to find this until I realised I needed enough eggs to make it moist and light.